Habitat: Columbia. 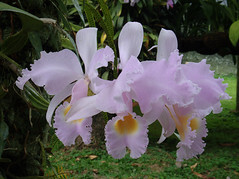 Cattleya schroederae is native to the eastern mountains from San Martin plains to Cazanare. Plant Size: Medium. Unifoliate. Cattleya schroederae is similar to Cattleya trianaei, but lacks the club-like pseudobulbs of the latter. It is free-flowering and the flowers are well-formed and make pleasing plants for collectors. Flower Description: Cattleya schroederae has flowers that are sweetly fragrant. The flower color is pale rose to pink suffused with white with a wavy margin. Lips and petals are frilly. There are several white or near-white cultivars available. The lip has yellow and deep rose markings. Flowers are not of heavy substance but are attractive and last up to five week. Flower form is full and round. The plant forms a sheath and rests for a while before developing flower buds. Bloom Season: Spring. Usually flowers in April. Growing Temperature: Intermediate to Hot (85 F day temperatures are prefered. Seedlings prefer 65 F nights while adults prefer 60 F.
Additional Information: I have seen Cattleya schroederae perform well when grown on mounts. Container culture is suitable, too. The plant is in active growth from the months of May to September and forms sheaths for next spring's flowers. Flower buds begin to develop after the New Year and bloom in the spring. Growth and flowering habits are very similar to Cattleya trianae. If used as a cut flower, allow four to five days for the flower to mature prior to harvest. Water heavily and fertilize during active growth. Do not fertilize after August while the plant is dormant since this species is susceptible to salt accumulation in the growing medium.